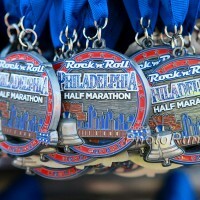 Last year I registered for this race – the Philadelphia Rock n’ Roll Half marathon, that is – but didn’t make it because of a change in plans. So I’m really excited to participate this year with Kristine, my one of two friends who will run long distances with me! The race is sold out so it should be pretty crazy! The race is tomorrow morning, so I’m hopping on Amtrak with Kristen (our official running cheerleader!) this morning. Will post tomorrow night, post-race!